For a catalogue of Elizabeth’s works available for loan, rental or purchase, please visit the Canadian Music Centre library online. Established in 2012 by blogger Frances Wilson (“The Cross-Eyed Pianist”), Meet the Artist is a series of interviews in which musicians, conductors and composers discuss aspects of their creative lives, including inspirations, influences, repertoire, performance, recording, significant teachers and more. The interviews offer revealing insights into the musician’s working life and each one provides advice to young or aspiring musicians. 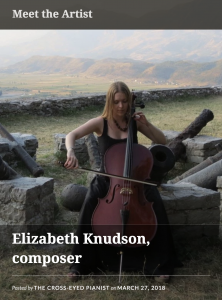 Elizabeth Knudson was the featured artist for the week of March 27, 2018. 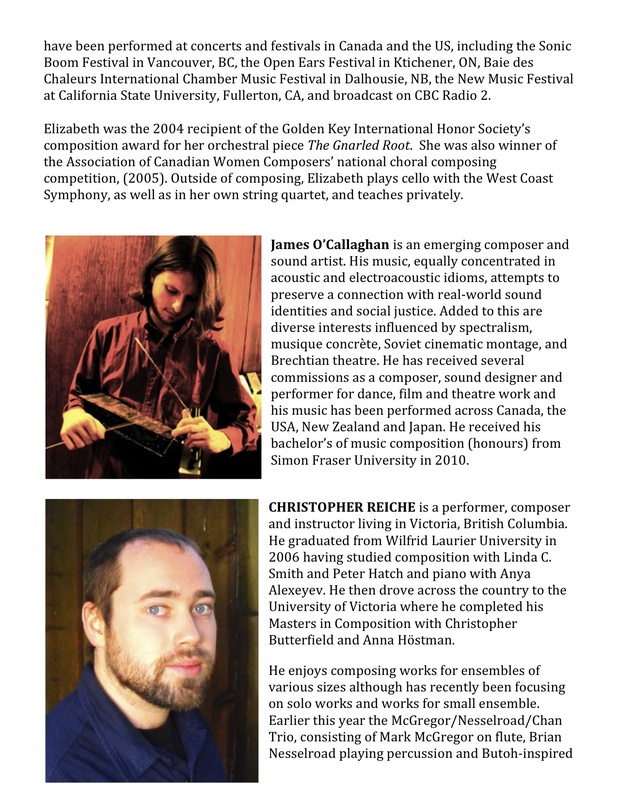 The composer interview by Alina Noir (see below– Oct. 2015) was also published by Cuckoo Magazine, and was featured in their online blog. Alina Noir, visual and multimedia artist based in Lyon, France, has created an interview feature with Elizabeth (as part of a series of multimedia artist interviews), for her online blog. Click on thumbnail image to view article. As of 2013, Elizabeth has begun documenting some of her composing-related travels. To follow her musical adventures, click on the image below, or follow the blog link here. Alchemy trio for horn, cello & piano is now available for purchase through the International Horn Society, here. 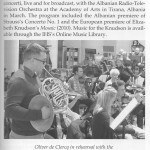 Alchemy was funded in part by the Meir Rimon Commissioning Assistance Program of the International Horn Society. 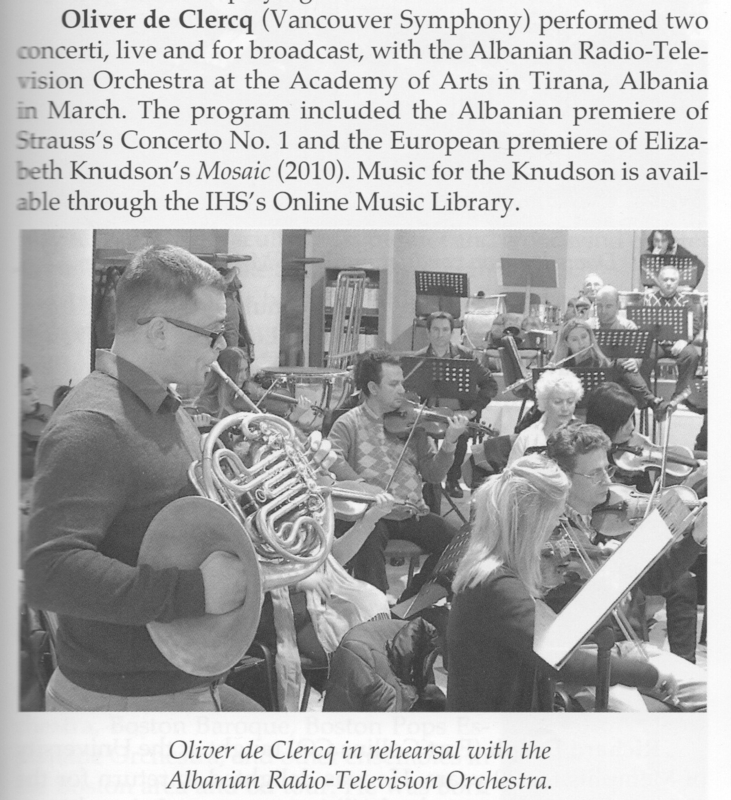 Mosaic concerto for horn, with piano orchestral reduction (original version for solo horn & orchestra) is now available for purchase through the International Horn Society, here. (Please note that the full orchestral version- score & parts are available through the Canadian Music Centre). 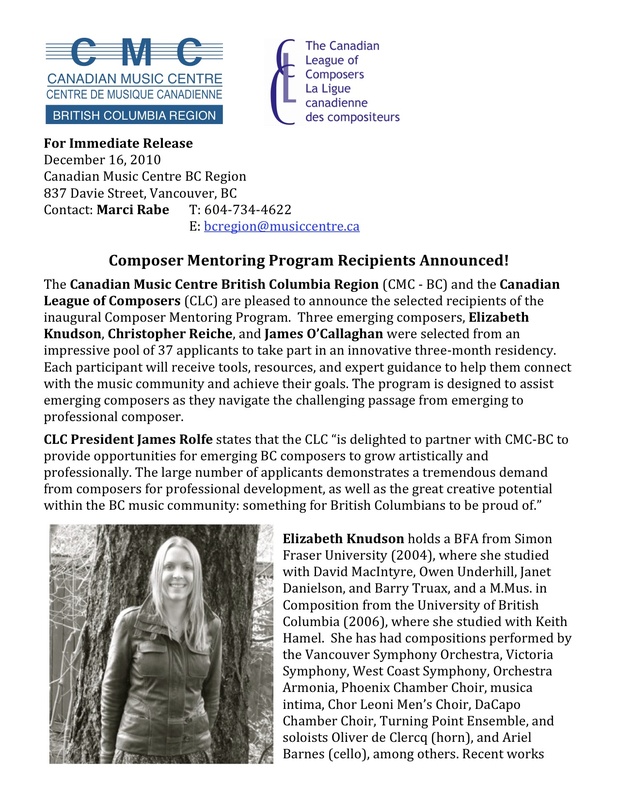 Announcement of the recipients of the Canadian Music Centre (BC Region) & Canadian League of Composers’ inaugural Composer Mentorship Programme. Click on thumbnail images to view press release. Northern Tango– published in 2007 by the Canadian National Conservatory of Music, as part of “Making Tracks: Small Town Canada, Vol. 4″- a collection of 22 piano solos by 18 Canadian Composers. 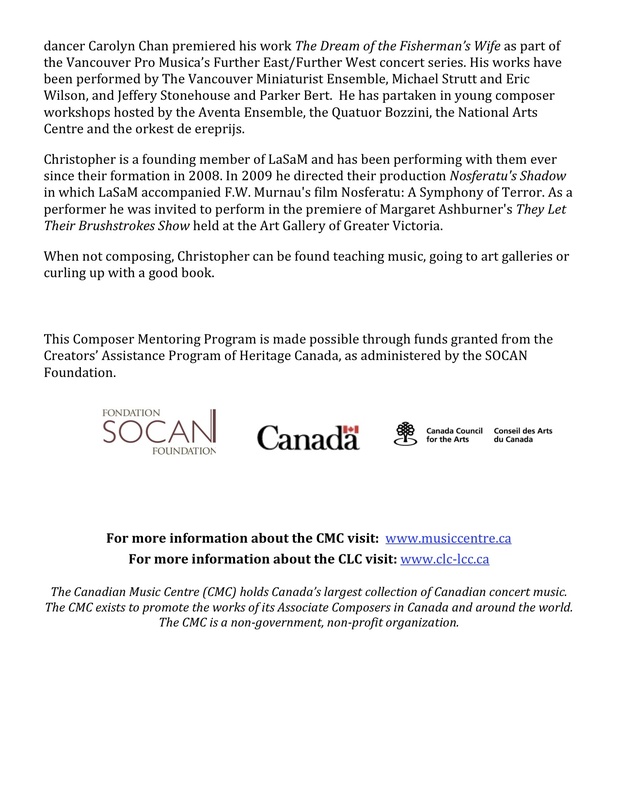 For more information about this collection, or to purchase a copy, please visit the Canadian National Conservatory of Music.